MY REVIEW: When you team up the Cohen brothers as writers with the masterful storyteller and director Steven Spielberg, you expect to get something special. And BRIDGE OF SPIES is just that - something special. 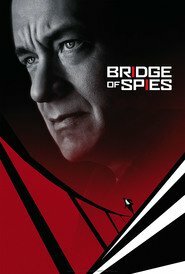 It's the true story of James B Donovan (Tom Hanks), a lawyer with no criminal trial experience, who is asked by the US government to defend a Russian spy, Rudolf Abel (played by Mark Rylance). It's a great story of a great man who served his country with integrity, despite the personal costs to himself. It's gratifying to see a true hero on screen in contrast to all the fantasy heroes we are used to seeing of late. The pace of the movie is subdued, but it is engaging and finishes with us on the edge of our seats. The cinematography is excellent and portrays the Cold War period well along with the story that breathes new life into this genre. Hanks is excellent in the starring role and all supporting cast are good. A solid spy drama that tells an important story. Go see it!